Go for black Roman blinds and your home will benefit from a look that’s always on-trend. 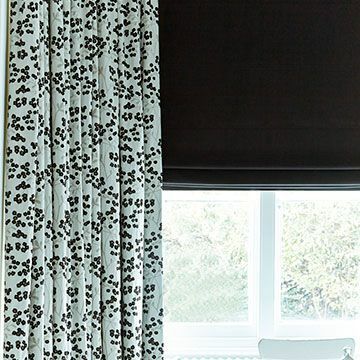 In our range, you’ll find black Roman blinds to suit all sorts of homes. There are subtle and strong patterns, including botanicals, geometrics and abstract styles. Our designs will coordinate with monochrome schemes or can add a touch of glamor to any décor. What’s more, you can choose a specialist lining for your black Roman blinds. Our thermal option will help insulate your home and our blackout choice can help stop external light entering through windows. Book a free home appointment and find out more about our range. One of our advisors will bring all our Roman blinds to your home, meaning you get an unbeatable opportunity to truly see which styles work best with your home. Your advisor will also offer you a professional second opinion: offering you tips and advice, before measuring up and giving you a no-obligation quote.